February | 2016 | Moynihan Insurance Agency, Inc.
Be Fire Smart with Electricity throughout your home. Be Fire Smart with Electricity thoughout your home. In Celebration of President’s Day Our Offices will be closed on Monday, February 15, 2016. Enjoy a Safe, Warm, Great President’s Day & Long weekend from everyone here at Moynihan Insurance Agency, Inc. Here are Some Tips from Arbella Mutual Insurance to Deal With the Frigid Temps!! Valentine’s Day is coming up, and our hearts may be warm but the air will be cold! This weekend, forecasters anticipate frigid temperatures throughout the Northeast beginning Friday night and lasting until Monday. That means potential subzero lows that could lead to frozen pipes, which is enough to ruin any romantic weekend. Planning a warm-weather getaway with your family for winter vacation? While you’re soaking up the sun, you may be leaving your home vulnerable to the cold. Nothing ruins a great vacation like coming home to a disaster. So before you head to the beaches, here are a few tips to help safeguard against frozen pipes. • Turn up the heat! Set the thermostat to the same temperature day and night. • Open the kitchen and bathroom cabinet doors to allow warm air to circulate around plumbing. • If you have an attached garage, keep the doors shut. Wind and cold air drafts increase the likelihood of a frozen pipe. • If you are going away, shut off the water supply line to your washing machine. • Drain and shut off all outside spigots. • Have someone check on the house. Once the ice melts and the temperatures rise, the water will start to flow. Mark the shut off to the main water supply line so it can be easily identified. When you’re skating on a pond on a brisk winter day, or enjoying a cool glass of lemonade in the heat of summer, ice can be your best friend. However, when it comes to protecting your roof and your home, ice is your worst enemy. Like, arch-nemesis kind of thing. Like Batman and the Joker. Make sure you’re prepared this winter by following our tips to combat ice dams! Why do bad ice dams happen to good people? You know those perfect fall days where you want to ignore all the fallen leaves and just watch football all day? Well, those leaves are mad that you ignored them and now they’re clogging your gutter. But if you keep your gutters clear of leaves and snow, then your downspouts can do their job. And pick up a roof-rake at the hardware store to help clear the snow—it’s well worth the investment! Okay, so despite your efforts you still have an ice dam. Calm down, take a deep breath, and attack the problem. Use a melting agent like calcium chloride . However, don’t use a blow torch (do we really have to say that?) because you’ll probably end up causing more problems than fix. Just trust us on this one. For more information on ice dams, check out our flyer. Last year’s record breaking snowfall has many Massachusetts residents concerned that this winter will mirror 2015. While predictions vary for what’s in store, the Massachusetts Office of Consumer Affairs and Business Regulation and the Division of Insurance recommend preparing in advance to minimize the circumstances that can lead to claims from winter storms. Consumer Affairs Undersecretary John Chapman reminds property owners that damage caused by snow, freezing rain, and cold temperatures can be minimized with proper precautions. Routine maintenance can also help consumers avoid claims on their homeowner and auto insurance policies, helping keep premiums down. The Division of Insurance recommends consumers take preventive measures when preparing a home or vehicle for the winter season. All walkways and driveways should be cleared of snow and ice and treated with ice melt. Salt ice melt can be dangerous for animals. 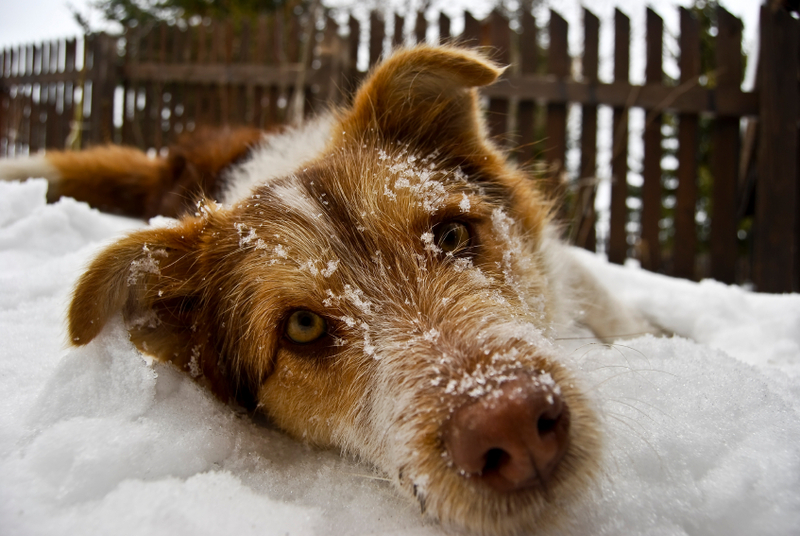 Use a pet-friendly alternative to avoid illness or injury to animals. Make sure your trees are trimmed back from your house and away from power lines. Clear gutters and downspouts and keep roofs free of significant snow accumulation. Inspect the underside of the roof for signs of leaks. Make sure the chimney is clean and in good working order. Make sure all water pipes are properly insulated to prevent freezing. If your smoke detectors and carbon monoxide detectors are electric, make sure you have a battery back-up. Check the heating system and make sure heat is being delivered to all vents. Make sure tires have adequate tread and the recommended air pressure. Check your spare tire and make sure it, the jack, and lug wrench are all stored in the trunk. Make sure you have jumper cables, a shovel, tire chains, a bag of salt and sand, basic tools, and a medical kit. Carry a cell phone and have a flashlight, ice scraper, snow brush or broom, and signaling devices such as flares or reflective triangles in the vehicle. Bring along extra warm clothing, gloves, a blanket, food and water. Keep the windshield wiper fluid tank filled and carry an extra container of fluid in your vehicle. Make sure your wiper blades are in good working order. Maintain at least a half tank of gasoline. Clean snow and ice off your car as necessary. Call your insurance company’s claims reporting number as soon as possible. If you work with an independent insurance agent, notify him or her of your claim as well. Understand your coverage for potential wind and flood damage. Protect your damaged property to the extent you can to prevent further damage and salvage what you can. Note and photograph all damage and losses. This will assist in settling claims. If temporary housing is necessary, check your policy for Loss of Use coverage. Your policy may cover such expenses up to a stated amount. Be sure everything is considered in the claim. Back-up your claim with written estimates.